National Novel Writing Month or NaNoWriMo, is a challenge for writers to write fifty thousand words in one month. Breaking that down we’re talking about 1,667 words a day, roughly. It’s an amount which seems daunting at first, but with enough practice is fairly doable. 50,000 words is in the realm of The Great Gatsby, Fight Club and the Hitchhiker’s Guide to the Galaxy. If you need to see the length of what you’ll be writing, check those out on your book shelf. People might write beyond the fifty-thousand words and it’s exhilarating when you finally reach that point where the 50k margin’s hit and everything else is bonus time. The NaNoWriMo site has a word count tracker and it’s so satisfying to see the lovely little line graph bust its way beyond the confines of the fifty-thousand you’ve got to do. Fifty thousand words isn’t easy, not at first, certainly. There’s a low rate of people who win each year, but the good news is that succeed or fail, if you’ve written one word more than you would have otherwise, you’re still a winner. I’ve seen people have to drop out part way through from personal problems, maybe they burn out or decide that maybe this isn’t for them. That’s okay, we also see late arrivals each year and people who have no idea early on scrap everything they’ve worked on, get inspired and write up a storm for the final fortnight of the month. For a writing challenge, it gets pretty dramatic and pretty tense. Why are you reading this? Poor life choices, I’m guessing, but that’s okay, we still love you all. The name’s National Novel Writing Month, from when the founder, Chris Baty, held a contest with his friends in San Francisco to write 50,000 words during a normally grey and miserable-looking month where they wouldn’t be too distracted by anything else. Without NaNoWriMo, November’s a bit of a ‘meh’ month with nothing but cold and the distant promise of Christmas. It’s grown since then and NaNoWriMo is a bit of a misnomer with how global it is these days, but it sounds cool when you say it and look at it on a page, so we’re sticking to NaNoWriMo, logic be damned. NO, I MEAN WHY WOULD YOU DO NANOWRIMO? As someone who over-plans their books to no end (just see the amount of index cards and maps on my Twitter feed) I generally just need time to put fingers on keys. Writing isn’t my main job, I just rant about writing a lot. I love the craft enough that previous participants have threatened to kick my chair away if I babble about ‘the craft’ too much. I love writing, but I get distracted and I make too many projects. NaNoWriMo gives me laser-focus on one project at a time and a deadline to be done with it. If you’ve ever looked at some notes for a book you’d love to write and never make the time to, this might be the perfect time to get a first draft done. If you like the idea of writing but don’t know if it’s for you, then you have dip your toes in the water and see if it’s something you like. No. I know sometimes people worry about Nano High Council frowning on them writing a script, short stories, poems or all kinds of things. Each year I hear people asking about this and listening to the founder himself the perspective is that as long as you are making words, you are one of us and you’re welcome. Personally, I’ve written novels each time. Given the way I plan my work it fits long fiction a lot better for me. If I write short stories, reviews, anything like that, I need to write it ASAP and if I sit on the project I’ll forget it, get distracted and it’ll end up drifting away from me. A novel allows me to plan chapters, scenes and such. I’ll get onto those soon. HOW DO I TAKE PART IN NANOWRIMO? Here’s the great thing; You’re not novelling alone. If you want, you can have NaNoWriMo be as personal or social as you like. www.nanowrimo.org is the home of the contest, where people can set up a profile and track their word count. If you want to just do that then go ahead, it’s a great way to see how well or badly you do, even adjusting your average words per day if you lapse a bit or shoot really far ahead. There are a few other things you’ll want to consider, though, especially these days where all of the social media are kicking around for us to make use of. 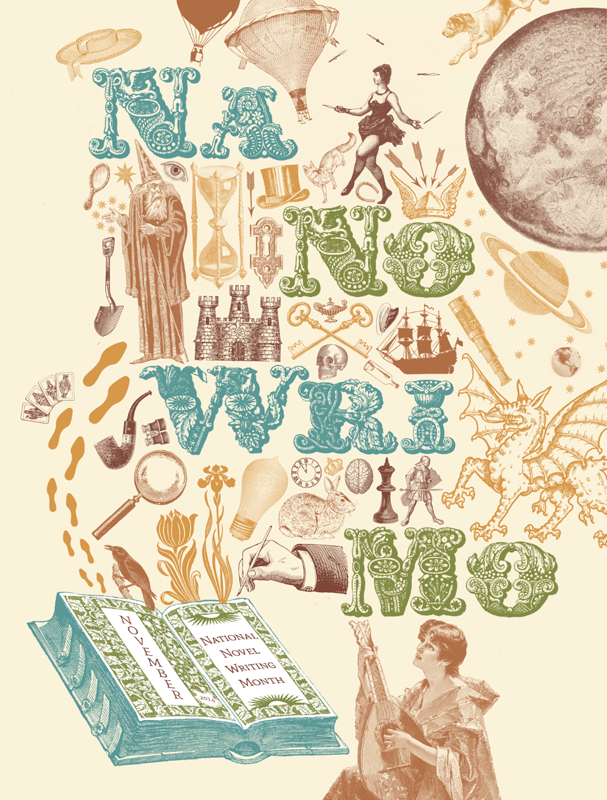 The NaNoWriMo site has vast forums which include sections for random ideas, distractions and help with research. I admit I tend to only dabble with those when they serve my purposes, but they can be really helpful. When creating your profile you can select your home region and you’ll be matched with a local community. This is where NaNoWriMo comes alive. I live in Brighton, England. Our community is fantastic. I only attended one write-in and the closing party on my first year, but even now I’m friends with people from those events. Having a physical support group in addition to the online one really helps. I hang out with a lot of writers these days, but the first couple of years felt like a lonely experience; a self-imposed exile from a lot of my free time and an odd explanation to anyone who asked why I couldn’t go out drinking with them. The organisers or, “Municipal Liaisons” of the Brighton & Hove community were great at arranging social gatherings where people can meet up and write. The act of simply being in the same physical space as others going through the same self-induced mix of fun and trauma creates a sense of camaraderie. We would invade a coffee shop or pub, set up laptops or notepads and write away for a few hours a couple of days a week. During this time there were competitions in the form of “word wars” where people would try to write the most they could in a set amount of time. There was the “Panic Jar” where people would draw random plot elements if they were stuck. We even had a social evening once a week to make sure people de-stressed. We’ve added a Facebook group, Twitter account, several splinter events in the outskirts of the community, an achievement system and one year an enterprising Wrimo created a version of Monopoly based on our NaNoWriMo experiences. Together our MLs Cerys & Ellie, along with the swarm of wonderful and strange Brighton Wrimos all made a tense challenge into an amazing community. Two of the writing groups I’m part of still include a lot of people I met there. In fact I enjoyed the Brighton Wrimo community so much that when Cerys & Ellie stood down, I was one of the people who offered to take the mantle of ML, along with my fellow games journalist and writer, Fred Black. Together we’re arranging venues and events for the month, we’ll be herding all the writers to and from places, offering support where necessary, talking to Nano High Council and of course writing our own novels as well. If you want to join in then visit www.nanowrimo.org. Good luck! www.fakedtales.com – My website, probably where you’re seeing this. www.dpadmagazine.com – Where I write about video games. www.hootingintotheabyss.blogspot.com – Where I write about card, board and roleplaying games. This entry was posted in NaNoWriMo, Shameless Self Promotion and tagged NaNoWriMo. Bookmark the permalink.